I met Marshall Rancifer outside his apartment complex in Chamblee, a big boxy housing development much like the kind that have been growing like weeds all over the city. Marshall is a big presence, but not just because he’s easily a foot taller than I am—he radiates enthusiasm, launching into what he calls “the whole story about Atlanta’s homelessness” before we even get to the door. Although he lived in and around the English Avenue neighborhood just west of Downtown Atlanta for most of his life, Marshall can’t find an apartment inside the city’s perimeter anymore that will take him on as a lessee. “It’s because of my felony conviction,” he explains. Ask anyone in Atlanta who to talk to about the city’s homeless communities, and they’ll point you right to Marshall. Formerly homeless himself, Marshall spends most of his days doing outreach with Atlanta’s homeless community. Over the last 20 years, Marshall has spent the majority of his time walking around Atlanta’s neighborhoods trying to get to know the city’s homeless people, coordinating donations from advocacy groups, asking homeless folks about their experiences with city services, and trying to bring their concerns to city stakeholders. Marshall’s work is propelled in part by his own experience dealing with addiction and homelessness in Atlanta. During his time living on the streets, Marshall was turned away from 24 different churches before finding his way into a rehab program for his substance abuse issues. The day he got out of rehab, he took a shower, and caught a glimpse of himself in the mirror. Weighing in then at about 127 pounds, he certainly didn’t look much like he’d remembered. And then, a familiar song came on the radio. “It was Michael Jackson’s ‘Man in the Mirror.’ I just burst into tears and I promised God in that moment that I would do anything I could to help any other sick and suffering addict or homeless person not have to suffer the indignities that I had to suffer through trying to get help,” he said. On any given day, Marshall is helping coordinate HIV and hepatitis testing, overdose response trainings, syringe exchanges, and coat and blanket distributions. But it’s usually more than that. “We don’t just go out there and hand stuff to people, we go out there and spend two, three, four hours in one location just building a relationship with folks, so when they’re ready, we know what the best possible scenario to help get them off the streets,” he explained. “One of the reasons we’ve been so successful is we build those relationships.” Marshall’s phone and Facebook account pinged incessantly throughout our conversation with messages from people who are or are soon to be homeless looking for guidance. “I can’t get to all of them,” he said. Marshall lowered the volume on his phone as we walked inside, dimming the voices coming from an app on his phone he uses to listen to the local police scanner to keep track of overdose calls for homeless folks. “Sometimes the police get mad at me when I get there before they do,” he says with a chuckle. Today alone, he responded to two different calls with overdose response kits. Marshall started responding to overdose calls in part because he felt like he needed to take matters into his own hands. Over the years, he’s watched what seems a lot like a trap evolve across city policy and policing. The application of “quality of life” ordinances that range from small marijuana possession to “urban camping” can result in weeks’ worth of jail time for those who can’t afford bail money. A few weeks in jail is generally enough time for a person to lose a job or an apartment, which can in turn force people out onto the streets. Marshall has also watched what few free and working addiction and mental health resources existed for homeless people with substance abuse issues evaporate over the last few years. He used to refer people regularly to treatment at Jefferson Place, another downtown emergency shelter near the city jail, but the treatment center closed a few years ago. The loss of these services has been hard on Marshall’s work. “I’ve lost more people back to the streets in the last one and a half years than I ever did before. When I try to get them in treatment, there’s nowhere for me to place them,” he said. Marshall sees these policies hit Atlanta’s Black communities hardest. Marshall parsed through three years of Atlanta Police Department uniform arrest report records himself and found that a whopping 87 percent of these “quality of life” charges were filed against Black people. As of the 2016 Point-In-Time Count (an annual census survey of the city’s homeless community), 86 percent of Atlanta’s homeless population is Black, compared to just 54 percent of the city’s total population. To Marshall, it seems that city policymakers are part of a concerted effort to neglect and ultimately push out poor, Black people in the city. The application of “quality of life” ordinances that range from small marijuana possession to “urban camping” can result in weeks’ worth of jail time for those who can’t afford bail money. For many in the homeless community, Atlanta feels increasingly inhospitable. Popular community spaces for homeless communities have seen an uptick in “quality of life” policing. Underground Atlanta, a formerly popular shopping space that used to leave restrooms open to homeless people, recently closed off the bathrooms to prepare for an upcoming mixed-use development project. Renaissance Park, a common gathering spot for many homeless folks, was closed off and barricaded for reported maintenance issues. And, the city’s only no-barrier emergency shelter, Peachtree-Pine, closed in the summer of 2017, taking upwards of 575 beds with it. That means for right now, Atlanta doesn’t have emergency solutions for the 681 homeless people sleeping on the streets on any given night. It does, however, have laws against sleeping outside. 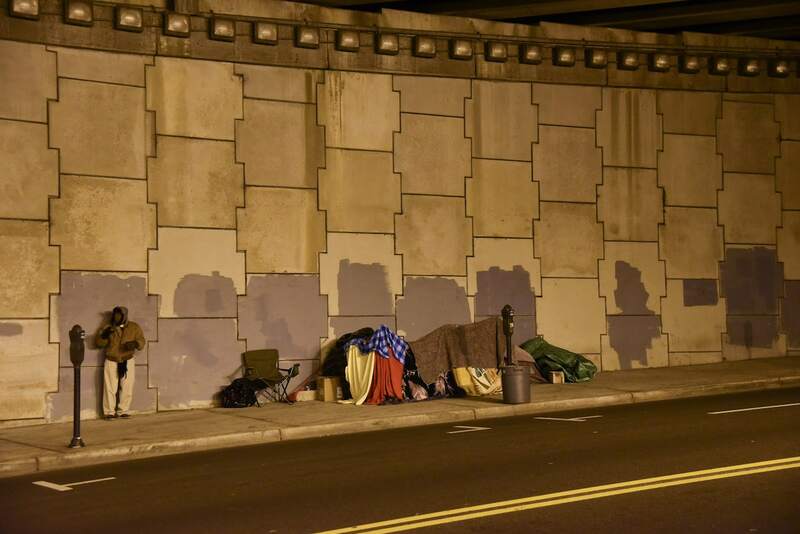 The Metro Atlanta Task Force for the Homeless operated the Peachtree-Pine shelter, the city’s largest homeless shelter located along the lucrative stretch of Peachtree Avenue connecting Atlanta’s midtown and downtown commercial areas, from 1997 up until its closure last August. The shelter aimed to provide a bed to anyone in the city who needed a place to sleep without the kind of barriers to entry maintained by the city’s other homeless shelters. Its role in serving the Atlanta homeless community, however, depends entirely on who you ask. When Rudy Urguehart, a case manager for the Task Force, first arrived in Atlanta from Maryland back in 2013, he tried a few different shelters, but was turned away at each because of overcrowding. He was advised to try the Peachtree-Pine shelter, where he has stayed and taken on increasing work responsibilities for the better part of four years. “It was the only shelter where they took anyone. They didn’t ask questions, they didn’t turn anyone away,” he said. For many homeless people I spoke with, Peachtree-Pine was an overflow space, somewhere you might end up if you couldn’t get into another shelter for the night, needed to spend a night off the street, or had to work a second shift outside the curfew allowances of other shelters. Some used the shelter only when they ran into trouble at shelters like Atlanta Union Mission, Gateway, or City Refuge. Some wound up at Peachtree-Pine and decided to stay long term. While the Peachtree-Pine shelter was widely used, it wasn’t particularly widely loved by residents. Many had heard of or seen sexual violence at the shelter, which some attributed to its failure to split men and women into different spaces. The shelter has had issues with tuberculosis outbreaks over the years. Robert Blackwell, a former resident, remembered having to wrap his mattress in sheets to avoid bedbugs. Both city officials and Task Force staff have complained about violence and criminal activity in and around the shelter. After years of public feuding and a bitter legal battle over the shelter property, nonprofit business development group Central Atlanta Progress purchased the Peachtree-Pine property for a reported $9.7 million in a legal settlement with the Task Force on the condition that CAP be allowed to close the shelter. Under the terms of the settlement, CAP also assumed the responsibility of re-housing the shelter’s long-term residents. CAP, in partnership with Atlanta Continuum of Care services, the United Way Regional Commission on Homelessness, and Crossroads Community Ministries, has pledged to assist displaced Peachtree-Pine residents by instead offering them permanent housing using Section 8 vouchers. “The goal here is to move nobody here from this shelter to another shelter, but to move them into an apartment,” explained CAP social impact director George Chidi. As of November, 2017, Chidi said that only 100 of the shelter’s former residents are still waiting for permanent housing (though some, he said, declined housing help of their own volition). The push for long-term housing is theoretically part of a push towards Housing First policies, an initiative adopted by HUD in 2009 to get chronically homeless populations into permanent housing as quickly as possible, ideally with wrap-around services to support them through the transition. Atlanta reorganized its Housing First approach in 2013, forming a nonprofit group called Partners for HOME, tasked with implementing a comprehensive city-wide Housing First policy and managing the city’s CoC grant. “We were spending about twice as much money on temporary and emergency shelter as we were on permanent solutions. There was a lot of recycling of homelessness. Strategically, we decided to flip that,” Chidi said. Continuing this Housing First strategy is the primary tactic of a $26 million Homeless Opportunity Bond put forth by the Atlanta City Council and approved by Reed at a July 2017 meeting. City Council simultaneously voted to adopt Partners for HOME’s 5-year Housing First-based strategic plan as its roadmap for how to spend the bond money. The plan promises to “employ a limited shelter expansion strategy that is directly connected to the scale of permanent housing” and instead focus more city resources on permanent housing solutions. The bond money will be matched by a $25 million donation from the United Way of Greater Atlanta, and a city spokesperson says the City of Atlanta plans to add an additional $66 million in public resources to the homelessness plan through its Invest Atlanta. The combined $115 million is intended to be used to place 500 chronically homeless individuals in permanent supportive housing, create 264 new emergency shelter beds, and help hundreds of families and youth find new housing or avoid becoming homeless. Atlanta believes it can not only help its homeless community, but eradicate homelessness in the city altogether. The Partners for HOME plan aims to end veteran homelessness in 2017, chronic homelessness by 2019, and both family and youth homelessness by 2020. In November 2017, HUD and the U.S. Department of Veterans Affairs recently confirmed that Atlanta had, in fact, “ended” homelessness for its veteran population according to schedule. That “end,” notably, was determined by meeting federal benchmarks for progress towards an end to homelessness for veterans; the city confirmed that at least 100 homeless veterans remain in the city, though they’ve reportedly been offered housing. These priorities, however exciting to think about, leave a fairly thin safety net for those who may still need temporary housing. Georgia State University sociology professor Deirdre Oakley estimates that without the Peachtree-Pine shelter, there are about 3,300 emergency and transitional shelter beds across about 20 shelters in the City of Atlanta, meaning if every single homeless person in Atlanta needed a bed to sleep in tonight, there still would be 270 people left outside. Moreover, all those beds are conditional upon various sobriety, job, curfew, cash, and other high bar requirements for chronically homeless folks to clear. Moreover, though the city plans to subsidize 800 units of new permanent housing, the city’s waiting list for public housing already has about 30,000 applicants waiting on new units to open, and is currently closed to new applicants. It was last open for just one week in March 2017, and before that, for one week in January, 2015. It remains unclear exactly where temporary housing options will be available in the wake of Peachtree-Pine’s closure and what those options could look like. The city has not yet established an official plan for the 264 new emergency shelter beds it says it will fund. Reed told reporters in November that the city planned to build “smaller shelters” across the city. Rudy told me that the Task Force is actively looking to purchase a new property, and may be close to closing on a new, similarly sized space to reopen an emergency shelter. Chidi said that CAP will reopen Jefferson Place, a shelter that previously housed 125 men and provided addiction treatment services before its closure a few years back, and is also considering building around 1,000 units of supportive housing. Marshall, for one, is largely unimpressed by the city’s proposed plan for the Homeless Opportunity Bond money. “Fifty million is just a drop in the bucket. That’s not going to alleviate homelessness in Atlanta,” he said. That money, he notes, pales in comparison to city investments in large, nearby mixed-use development projects at the Atlanta Civic Center. “Mayor Reed is great at investing in inanimate objects, but when it comes to investing in people, the poorest people in this city, ain’t no such thing,” Marshall added. Atlanta believes it can not only help its homeless community, but eradicate homelessness in the city altogether. On a recent Saturday morning I spent in Hurt Park, a popular downtown location for homeless service groups to distribute food and resources, I met Kay, a tall, slender man in his thirties picking up some food in the park before heading out to look for work. While we spoke, a slow-moving chase unfolded across the park. Police walked slowly around the park, shooing away groups of homeless people and volunteers trying to hand out goods, citing an obscure city ordinance requiring that volunteers have a permit to distribute food. Volunteer groups attempted to avoid ticketing by closing down their distribution operations, migrating about 50 feet to a slightly different location in the park, and setting back up. When police again came to disband them, volunteers again decamped and rebuilt elsewhere. Police issued at least one civil citation for lack of permit by the end of the day. Kay had seen this dance before, especially lately. “There’s a lot more of, ‘Where’s your permit?’” he said. One group he’d seen recently got some bikes from a nearby bike share stand and rode them slowly around the park, calling nearby homeless people over to pass out goods to avoid being chased out by police. He hasn’t seen that group recently, though. “Must’ve found a way to shut them down too,” he said. “It feels like ’96 all over again,” Kay added.